Many organizations nowadays use software to disrupt the market and create better services for their customers. These software-driven organizations deal with a lot of challenges, change & complexity. This faster changing world asks for more agility & flexibility. As a result, traditional development approaches are being replaced by empirical approaches, that are more fit to deal with these dilemmas. Scrum is a framework that was built on empirical principles (sense, learn & respond fast). The Product Owner in Scrum is the person who is responsible for the creation of value. He is the one who makes sure that customers and engineers work together on building valuable, high quality products. Many organizations turn their Project\Product Manager into a Product Owner. Although there is overlap and this seems like a logical thing to do, there are some huge differences between this traditional and new role. Many organizations struggle or fail the implementation of Scrum, because they do not understand these differences. In this official Scrum.org accredited training people will learn how to get the best out of the role of Product Owner. The training is a unique mix of theory & practice, optimized for the best learning experience. Unlike many unofficial Scrum trainings, this is the official Scrum.org-training that helps you prepare for the Professional Scrum Product Owner (PSPO I) certification. While Scrum.org and Ron Eringa deliver the inspiring context for this role, Seats2Meet takes care of an inspiring location. 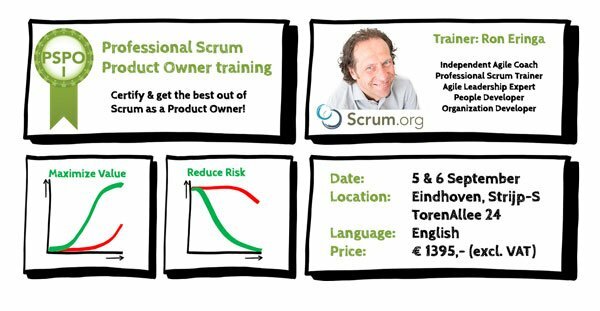 As a trainer for Scrum.org (the organization of Ken Schwaber, who co-created Scrum) Ron Eringa has trained over 500 professionals in the last few years. With 17 years of experience in software development, his passion and strength is creating leadership in all levels of the organisation. He has worked for companies like Philips, ASML, TomTom, ANWB, CCV, Rabobank & Achmea. Since October 2016 he became an entrepreneur as a trainer and consultant. Op alle S2M locaties worden regelmatig evenementen georganiseerd. Bekijk deze op onze Eventkalender .